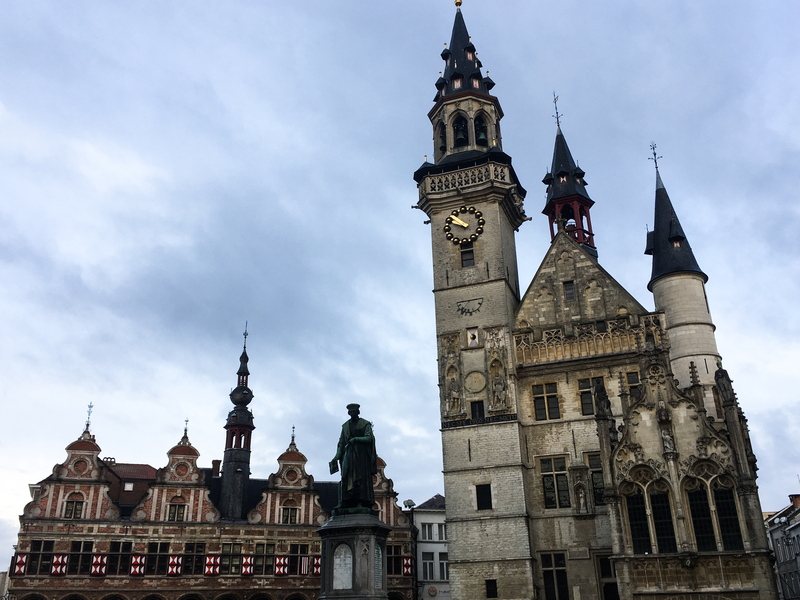 A short train ride or car journey from Gent lies Aalst (Alost in French) – half way to Brussels yet seemingly a world away from Gent, perfect for a day trip. That the city is unknown to many Gentenaars is baffling to this writer, given its beautiful Grote Markt, charming park, UNESCO-recognised carnival extravaganza and numerous events taking place throughout the year. The second largest city in East Flanders is home to around 80,000 residents, many of whom make the daily commute from Aalst to Brussels for work. Once famous for its onions, people from Aalst are known as ajoinen (dialect for onions) and a smiling, benevolent onion greets people from the top of the train station around carnival time! Aalst is also the home town of Louis Paul Boon – one of Belgium’s most influential writers who penned Chapel Road (De Kapellekensbaan) and My Little War (Mijn kleine oorlog) – and Dimitri Verhulst who wrote The Misfortunates (De helaasheid der dingen) that was later made into a well-known movie. With the city centre pedestrianised, there is a lot of shopping to do in Aalst, and that surely attracts many people; however the star of the centre is clearly the 13th-century gothic Schepenhuis (Alderman’s House) and its 15th-century belfry. The former town hall is beautiful and is picturesquely set on the Grote Markt next to the former stock exchange building. In front of the schepenhuis stands a statue of Dirk Martens, who is credited with bringing the printing press to the southern part of Low Countries. Through his book printing and personal network he also brought humanist ideas to Belgium: he printed the first edition of Thomas Moore’s Utopia, as well as the works of Erasmus and the discoveries of Christopher Columbus. Due to the infrequency with which the statue is cleaned he is locally known as de zwarte man (the black man)! A stone’s throw from the Grote Markt is another important building: Sint-Martinuskerk (Saint Martin’s Church). This gorgeous gothic church was completed in 1480 and boasts some beautiful paintings – including one by Rubens called the Saint Roch Altarpiece – and some impressive statues and sculptures. 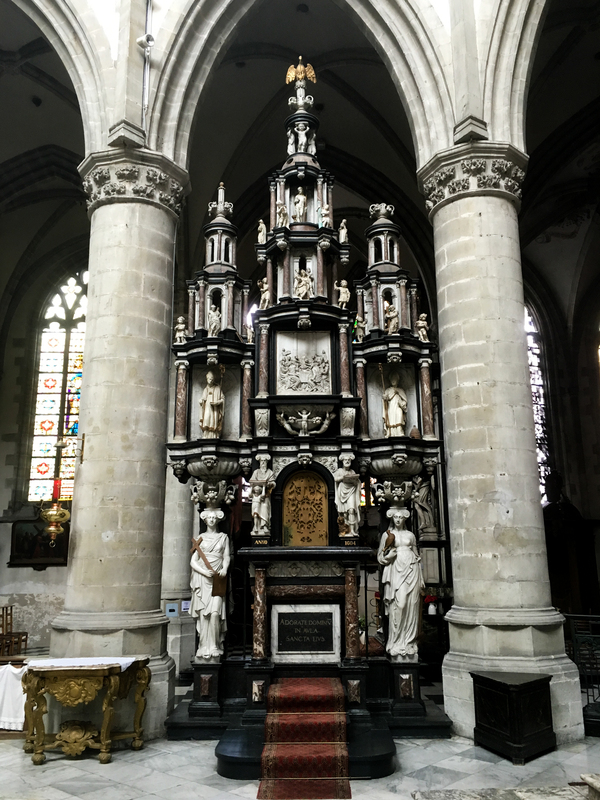 Some of the most stunning work (such as the tabernacle near the altar) is by Hiëronymus Duquesnoy the Elder, the sculptor who is best known for Manneken Pis in Brussels. His son, Hiëronymus Duquesnoy the Younger, sculpted the tomb of Bishop Antonius Triest, the seventh bishop of Gent. It can be seen in Saint Bavo’s Cathedral in Gent. With such an impressive church it is easy to see why Aalst is one of the few parts of Belgium that celebrates Saint Martin’s Day on 11 November! Not to be outdone by the city centre, Aalst boasts a European arboretum called Stadspark. Finished in 1915, it is a delightful area: bordering on woodland, small walking trails carry visitors around lush vegetation and ponds with swans and other birdlife. A mirror pond adorned with arches is where you’ll find locals trying their luck at fishing. For children there is a playground, and for the adults a small cafe called ‘t Melkhuisje (the little milk house). Every Monday evening from July to August, concerts in the Stadspark organised by a group called Parkies attract thousands of people. For other events in the city check out Curieus Aalst: every January this organisation puts on a New Year’s Concert (in 2017 it featured pieces by Bach, Beethoven and Saint-Saëns) and run a few other activities throughout the year. For cycling enthusiasts, Aalst will be a welcome destination. The Tour of Flanders (Ronde van Vlaanderen) is an annual event, taking place in early April, which goes through Aalst. It is the last event of the Flemish Cycling Week (Vlaamse Wielerweek). Despite these attractions, many people know of Aalst because of its famous Carnival. This three-day extravaganza, beginning on the Sunday before Lent, was listed by UNESCO on the list of Intangible Cultural Heritage of Humanity in 2010. It is one of the most irreverent spectacles in Europe: teams of friends work throughout the year on the construction of flotillas that, on the first day of the carnival, carry giant effigies in a parade that often insult local, national and international politicians. Nothing is sacred and everything subject to ridicule, including the people of Aalst themselves. Many of the men dress up as women in over the top outfits and on Tuesday, the last day of carnival, strut their stuff in the Stoet van de Voil Jeanetten (dialect for the Parade of Dirty Sissies, Jeanette being a highly derogatory word whose use is discouraged outside of Aalst Carnaval). Being carnival, there will be a lot of beer consumed and the local beer is not to be missed! 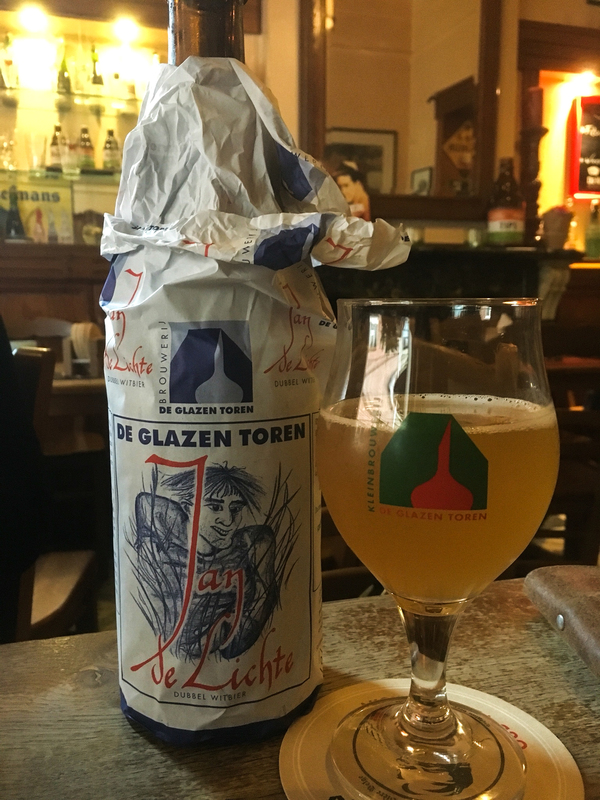 Of particular note is beer from De Glazen Toren brewery and their five unique 750ml bottled beers, including one named after an infamous 18th-century bandit called Jan de Lichte who was executed on the Aalst Grote Markt and whose story was popularised by Luis Paul Boon in his book De Zoon van Jan de Lichte. To sample this and other local beers, head to the cosy Café Den Babbelaer on the Klapstraat, close to Sint-Martinuskerk. 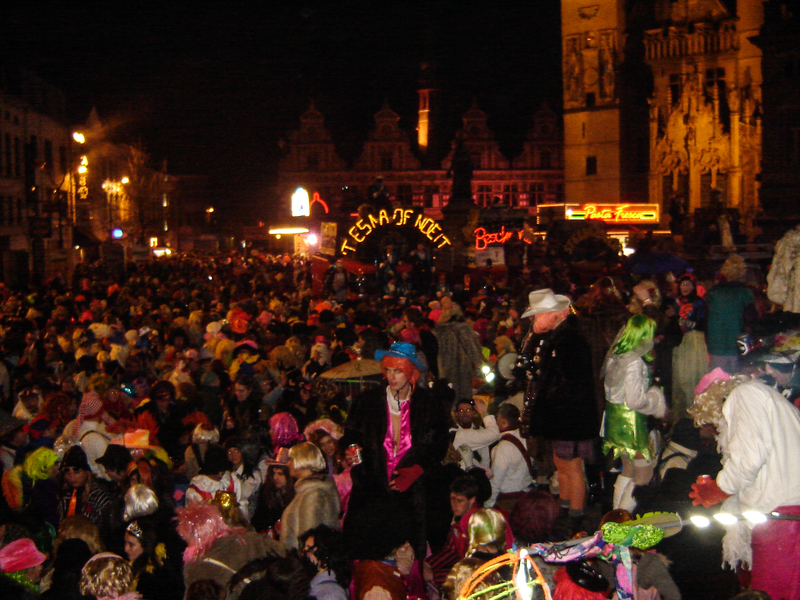 Will you be at the Aalst Carnaval this year? What are your favourite things to see and do in this city? Let us know in your comments below and suggest other locations for us to write about as part of our Day Trips from Gent article series. Having travelled to Gent many times as a visitor, Duncan Gardiner moved from Australia to Gent with his wife in 2016. He makes the commute to Brussels and back every day for work. This gives him plenty of time to read and learn Dutch! 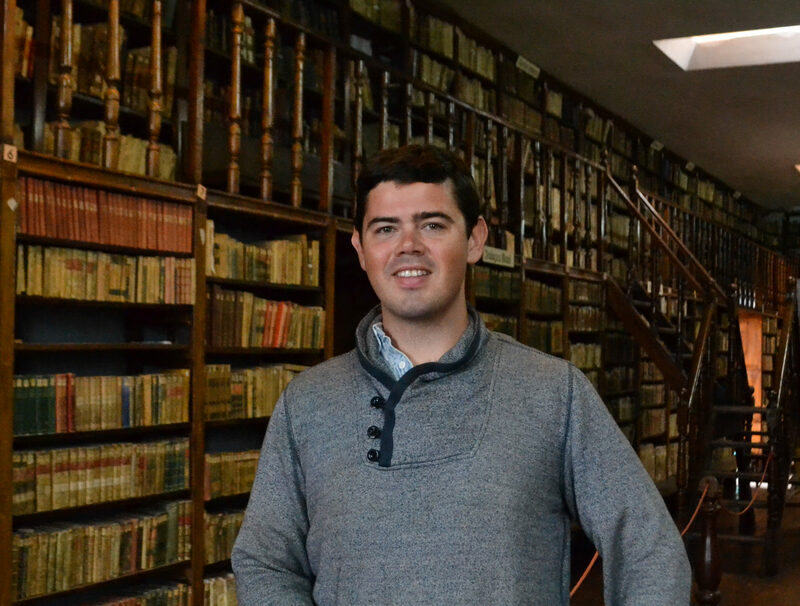 Having lived in France and travelled extensively in Latin America, he enjoys languages, literature, history and travelling.